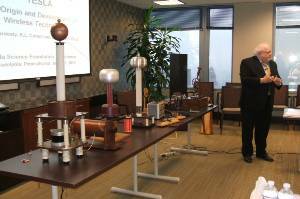 This July in Philadelphia, the Tesla Science Foundation will be hosting a three-day conference and celebration to commemorate Nikola Tesla's legacy and world vision. Tesla was a brilliant inventor who lived during the turn of the 20th century. His innovations resulted in the implementation of alternating current, radio, the AC motor, wireless technology, and many other influential inventions that we now take for granted in the modern age. Tesla's vision to bring clean, free energy to the world through advanced wireless technologies was blocked by the financial and corporate interests of his time. Through this event, the Tesla Science Foundation will bring together like-minded scientists, inventors and enthusiasts who share the common goal of bringing Tesla's advanced energy technologies to fruition for the betterment of humanity. Click here to read a report by Michael Riversong and see photos from the conference.